Take a drive down a country road, and you’ll often see trash bags splattered all over the road. I know because I bicycled 10 times across America at 12 miles per hour to see our garbage-strewn continent up close and ugly. Ironically, most people zoom by in cars at 60 miles per hour and can miss seeing much of the dirty underbelly of America. Even worse, the vast majority of people won’t pick up any trash along roads because they can’t be bothered. With a population of 321 million people in 2015, the United States generates 4.5 pounds of trash per person 24/7. We create more rubbish than most of the rest of the world, but other countries catch up as they grow their populations by 80 million annually (net gain). 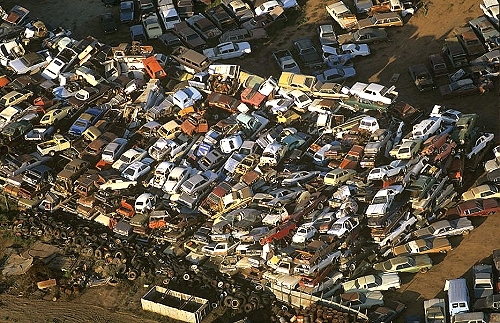 China adds 27 million cars to their highways annually, and as those autos age, their dead carcasses litter the landscape. China tosses more than 900 to 1,200 million tires annually as they continue their quest to be more like Americans; the U.S., 250 million tires annually. Plastic bags – Americans consume 60,000 plastic bags every five seconds according to the Sierra Club. The people of the world consume 240,000 plastic bags every 10 seconds, with no end in sight. Consequently, our landfills ingest 30,000 tons of plastic bags annually. We recycle less than 1 percent of plastic bags. The amount of garbage we discard stupefies anyone who thinks about the ramifications of our future. Consequently, you heard about the 100,000,000-ton “Great Pacific Garbage Patch” that floats in a gyre 1,000 miles off San Francisco – about the size of Texas and up to 60 feet deep in every kind of plastic imaginable. We add 2.4 million pounds of plastics into the oceans to grow that garbage patch every hour according to the Clean Air Council of America. We add 1 billion humans every 12 years – so our oceans will continue to be destroyed. Paper – Americans use 15 million sheets of office paper every five minutes according to the Environmental Protection Agency. The average American uses roughly the equivalent of one 100-foot-tall Douglas fir tree in paper and wood products each year. We produce 9,960 pieces of junk mail that we print, ship, deliver and dispose of every three seconds in the USA. When you pile up the numbers for the USA, it’s overwhelming. When you pile up the numbers for India, China and other overpopulated countries, it’s downright sickening. Finally, Americans waste or cause to be wasted 1 million pounds of materials per person every year. This figure includes 3.5 billion pounds of carpet landfilled, 3.3 trillion pounds of CO2 gas emitted into the atmosphere, 19 billion pounds of polystyrene peanuts, 360 billion pounds of organic and inorganic chemicals used for manufacturing, 710 billion pounds of hazardous waste and 3.7 trillion pounds of construction debris. If wastewater is factored in, the total annual flow of waste in the American industrial system soars to 250 trillion pounds. And to think that America will add another 138 million people by 2050 – a scant 35 years from now – and the world will add another 3.1 billion in that time.